How do I record locally to my desktop? By default, you should see Record as an option at the bottom of your Zoom meeting window. Just click it. If you don’t see that option, you can enable local recording by signing in to the Zoom web portal and going to Account Settings. Navigate to the Local Recording option under the Recording tab and make sure it is enabled. How do I record to the cloud? To record to the cloud, you must have a Zoom Pro license or higher. If you have cloud recording, the Record button in your meeting interface, should feature a dropdown that lets you select Record to the Cloud or Record to the Computer (Local). To enable cloud recording, sign in to the Zoom web portal and go to Account Settings. Navigate to the Cloud Recording option under the Recording tab and make sure it is enabled. Where do I find my recordings? To find a view your recordings, go to the Zoom client and click Recorded under the Meetings tab. There you will find all your cloud recordings, as well as any local recordings on that computer. You can also find your cloud recordings in by signing in to the Zoom web portal and then clicking on My Recordings. Your cloud recordings will also be emailed to you once they’ve rendered so you can just click on the link in the email. What are the recording formats? Your recordings are in several formats: MP4 (video and audio), M4A (audio only), and VTT (chat transcript) format. For our Business, Enterprise, and Education plan customers, we also provide accurate and searchable machine learning-based Recording Transcripts along with your cloud recordings. Now let’s take a look at some of the new recording features. Make sure you have the latest version of Zoom installed to access these features! 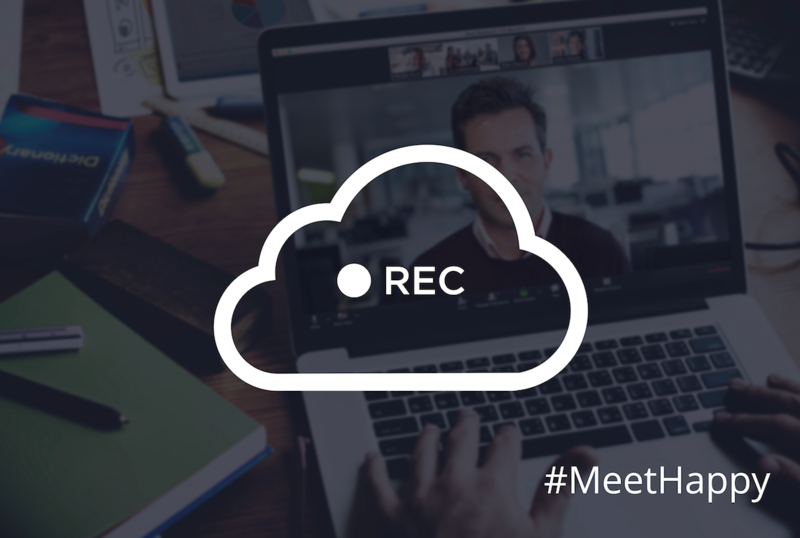 Cloud recordings of Zoom Video Webinars can now be made available on-demand. Registrants who missed your webinar can now have on-demand access to recordings whenever they like. Even people who didn’t register before the webinar can register after-the-fact from the same link for on-demand access. Registrant information will conveniently be added to your original webinar reports regardless of registration date. To create an on-demand webinar, sign in to your Zoom web portal and go to My Webinars, and then click Schedule a Webinar. Check the box named Make the webinar on-demand. With the popularity of on-demand content, this new feature was designed with everyone from marketers to corporate trainers to educators in mind. Now you can reach your audience with evergreen content on their terms, when the time is right for them. And you’ll still get their registration information! We’ve also added a new recording registration feature to allow you to track registrant information for both meetings and webinars! This feature is available for all Zoom hosts (webinar available for webinar account holders). You will be able to see who has registered and watched your meeting and webinar recordings. To enable recording registration, go to My Recordings. Find your desired meeting and then click Share, and enable On-demand (Registration Required). This feature is particularly helpful for education and corporate training and development where educators, administrators, and supervisors need to know which students and employees have watched recordings on a regular basis. Stay tuned for more blog posts on our new features! Want to bring these recording features to your organization? Sign up for a personalized 1-on-1 demo with a Zoom specialist today.